On this page you can learn about antifouling pollution issues affecting coastal boats and marinas in southern California. We also describe our field and economic research and outreach to assist boat owners, boating and coating industries, agency staff and policy makers in solving them. Publication links appear first; scroll down for project descriptions. The Influence of Boat Hull Coatings on Fouling Growth (2012) This fact sheet discusses the field research we conducted in Santa Barbara Harbor and Shelter Island Yacht Basin of San Diego Bay. The aim of the research was to discover the influence of hull coating type and hull coating age on fouling growth. Hull Fouling Copper Tolerance Fact Sheet (2011) Fact sheet summarizing recent scientific studies on the ability of hull fouling to tolerate copper antifouling paints on boat hulls and copper pollution in harbor waters. Includes a table of both native and non-native species that the research suggests can tolerate copper. Balancing Management of Marina Water Quality and Invasive Hull-Fouling Species (2011) Pertinent Scientific Findings Fact sheet summarizing research on: 1) alternative hull coatings' service life, industry capacity to apply and maintain them, and which boats are better candidates to use them; and 2) copper tolerance of hull-fouling species. 2 pp. To Clean or Not to Clean: Managing Fouling on Boat Hulls (2011) Fact sheet summarizing experiment to determine effects of in-water hull cleaning with California BMPs on next generation of invasive species and other fouling growth at recreational boat docks in San Diego Bay and Santa Barbara Harbor. 2 pp. on the Coasts and Delta of California and Baja California (2011) Fact sheet summarizing conclusions from a survey of nearly 200 boating industries on the coasts of California and Baja California and in the Sacramento-San Joaquin Delta. 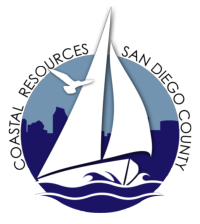 Industry groups included marinas, harbors, yacht clubs, boat repair yards, and hull cleaning, slip liner and boat lift companies. for Boats on California’s Coast, its Delta and Baja California (2011) Fact sheet summarizing average costs from a survey of nearly 200 boating industries on the coasts of California and Baja California and in the Sacramento-San Joaquin Delta. Industry groups included marinas, harbors, yacht clubs, boat repair yards, and hull cleaning, slip liner and boat lift companies. IPM for Boats: Integrated Pest Management for Hull Fouling in Southern California Coastal Marinas (2012) This 28-page illustrated technical report introduces Integrated Pest Management (IPM) for fouling control on recreational boats. IPM has been applied successfully for pest control in agriculture and buildings. It seeks to reduce the need for toxic chemicals by using a combination of tactics, such as mechanical, physical, cultural and chemical in a strategy that is tailored to the individual boat or marina and updated over time. The report also presents results of our research on the influence of hull coating types and age and of hull cleaning practices on fouling growth. Finally, it profiles 7 aggressive, copper-tolerant, hull-fouling “species of concern” that include invasive and other species found in our research. Although our report and supporting research are aimed at fouling control for recreational boats in south-central and southern California, the principles of IPM for Boats can be adapted for use in other areas. Crossing Boundaries: Managing Invasive Species and Water Quality Risks for Coastal Boat Hulls in California and Baja California (2012) This 16-page technical report presents the findings of our 2008 survey research of the boating industry on California's coast and 3 major boating areas of the Baja California peninsula. It presents data and analyses of industy capacity and costs to provide fouling control supplies and services that assist boat owners in managing risks of invasive species and impaired water quality. The report also summarizes data on boat travel patterns, analyzes how boater environmental awareness affects choice of hull coatings, and the potential for education to assist in managing water quality and invasive species risks along this 3,000 mile (5,000 kilometer) coast. Copper-Tolerant Hull-Borne Invasive Species: Further Analysis Fact Sheet (2008) Recent research on copper tolerant invasive species and their effects on native ecosystems. Click HERE to VIEW the VIDEO in English and Español. A Change is in the Wind for Antifouling Strategies (2000, 2010) This article introduces antifouling pollution issues in San Diego Bay and our research and education projects to address them. What You Need to Know about Nontoxic Antifouling Strategies for Boats This 2002 user-friendly technical report gives an in-depth, overview of the copper antifouling paints issue in San Diego and internationally as well as information on alternatives to copper-based antifouling paints. Staying Afloat with Nontoxic Antifouling Strategies for Boats This 2004 user-friendly, illustrated technical report presents a full analysis of the results of the demonstration project and a list nontoxic alternatives that were available in 2004. Transitioning to Non-Metal Antifouling Paints On Marine Recreational Boats in San Diego Bay This 2002 academic study report on our 2002 economic research with Dr. Richard Carson and Maria Damon of UC San Diego is 130 pages long. It presents findings and analyses of focus group interviews with San Diego Bay boating industry representatives, a survey of 200 San Diego Bay recreational boat owners, and extensive data compiled from the hull coating industry. The analysis considers economic aspects of transitioning recreational boats in San Diego from copper-based antifouling paints to nontoxic hull coatings. 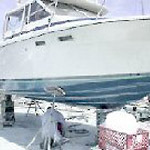 Making Dollars and Sense of Nontoxic Antifouling Paints for Boats This 2003 user-friendly, illustrated technical report summarizes the findings of the above economic study on nontoxic bottom paints in non-academic language. It includes helpful charts and a worksheet you can use to calculate your costs to use various coatings. UCSGEP-SD Fact Sheet 04-1 May 2004 - Nontoxic Antifouling Strategies Economic Incentives Study This 2004 fact sheet is 2 pages long and provides highlights of the above economic study. Levels of dissolved copper that exceed government standards have been detected in boat basins in San Diego Bay, Newport Bay and Marina Del Rey. Other crowded boat basins may experience this problem, too. According to studies by the San Diego Regional Water Quality Control Board, the Southern California Coastal Water Research Project, and the US EPA, high copper levels are primarily due to antifouling paints on boats. Nontoxic bottom paints are an option for boaters to help lower copper levels in these waters and protect the marine life that provide food for fish and birds. Copper-based bottom paints are designed to release copper into surface waters to slow the growth of fouling organisms. Recreational boats spend much time at the slip so most of the copper in the bottom paint is released there. It builds up in the water column and sediments and may reach toxic levels. Scientific studies show that dissolved copper at concentrations found in areas of San Diego and Newport Bays affects growth, development, and reproduction of marine life such as mussels, oysters, scallops, sea urchins, and crustaceans. Regulations to reduce dissolved copper levels are being planned. Nontoxic antifouling strategies are an effective way to reduce copper pollution from boats. 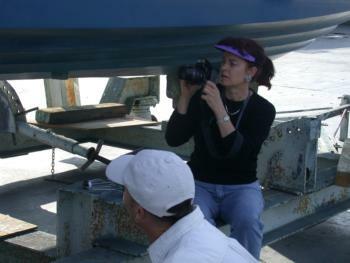 To help boat owners make decisions about nontoxic antifouling strategies, the University of California Cooperative Extension conducted a field demonstration of nontoxic boat bottom paints during 2002-2003. The demonstration was funded in part by the US EPA and the California State Water Resources Control Board 319(h) program. The project studied the performance of one silicone- and two epoxy-based coatings on six recreational boats in San Diego Bay. Underwater hull cleaners for the project boats reported on coating conditions, fouling growth levels, and diver effort each time the vessels were cleaned. These reports were analyzed to determine coating performance throughout the year. Coating performance is affected by water temperature, regular vessel maintenance, cleaning methods used, and frequency of boat use. Results of the demonstration project are providing boaters with vital information for choosing the best nontoxic antifouling strategy for their vessels, especially for those in southern California. The University of California Cooperative Extension and the University of California, San Diego Department of Economics collaborated on an economic study mandated by Senate Bill 315. California Senator Alpert and former Assemblyman Howard Wayne introduced Senate Bill 315 which was passed by the Legislature in 2001. The Bill mandated a study to identify incentives for boaters to use nontoxic alternatives to metal-based antifouling hull coatings. The Legislation also established the San Diego Advisory Committee for Environmentally Superior Antifouling Paints to make recommendations and advise on the preparation of the study report. 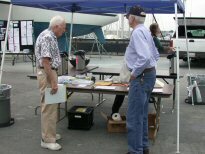 Voting members: San Diego Association of Yacht Clubs, San Diego Port Tenants Association, San Diego Unified Port District, San Diego boatyard, marina, and recreational boater representatives, California Professional Divers Association, Environmental Health Coalition, San Diego Regional Water Quality Control Board, Department of Boating and Waterways, University of California Sea Grant Extension Program. Non-voting members: The United States Navy, Department of Pesticide Regulation. In 2002 we conducted the San Diego Bay-focused economic research that was mandated by California Senate Bill 315. The study team included professor Richard Carson and graduate student Maria Damon of UC San Diego as well as Coastal Resources Advisor Leigh Johnson, Program Representative Jamie Miller (Gonzalez) and Student Itern Bobby Koga of UC Cooperative Extension. We conducted focus group interviews with boating industry representatives, surveyed 200 recreational boat owners and collected data from hull coating industry representatives and surveyed scientific and other literature. The analyses considered economic and technical aspects of how to facilitate a transition from copper-based to nontoxic hull coatings for recreational boats in San Diego Bay. Findings also addressed the implications of potential policies to reduce the use of copper in hull coatings on recreational boats in San Diego Bay. We found that substantial cost savings could be achieved by extending the transition period from 7 years (the minimum time, given local boat repair yard capacity) to 15 years (average interval between times that hull coatings must be stripped completely off the hull). The hull stripping interval was important because many nontoxic coatings will not adhere to old layers of copper paint and stripping technologies available at the time were costly. Links to the scientific study report, a user-friendly and illustrated technical report and a 2-page summary appear farther up on this page. On October 4, 2003, the University of California Cooperative Extension (UCCE) held its second Nontoxic Antifouling Strategies Field Day. The Field Day was hosted by the Shelter Island Boatyard where four of the six project boats were hauled for the public to view and inspect. A total of 80 people attended the Field Day including numerous individual boaters and people who represented 23 organizations. Boat owners and industry representatives discussed their experiences with nontoxic boat bottom paints while UCCE representatives summarized their findings from inspecting the boats and insights from the diver report data that had been collected during the project. The UCCE presented the results of the demonstration project from the past year and boat owners, underwater hull cleaners, and boatyard representatives participating in the project were available for questions. Results from the economic study on incentives for boaters to use nontoxic antifouling strategies were also presented by the UCCE to the public. The field day is part of the demonstration conducted by the UCCE on nontoxic bottom paints which are alternatives to traditional, copper-based bottom paints used by recreational boats. The build-up of copper from bottom paints is harmful to different life stages of mussels, oysters, scallops, sea urchins and crustaceans which are part of San Diego Bay's food chain. Total Maximum Daily Load studies that were conducted by the San Diego Regional Water Quality Control Board for the Shelter Island Yacht Basin in San Diego Bay and by the US EPA for Newport Bay found toxic levels of dissolved copper. Other areas with elevated levels of dissolved copper include other parts of San Diego Bay, Marina Del Rey and Oceanside Harbor. The UCSGEP would like to help boaters learn about nontoxic antifouling strategies to prepare them for potential restrictions on copper-based bottom paints. Bringing awareness to the boating community about which nontoxic bottom paints are available and about the benefits of switching to them is a priority for the UCSGEP. Field Day 2003 was a success! People who attended reported they learned about the copper pollution problem and about the alternatives to copper-based paints. In addition, 82% of those who completed an evaluation at the Field Day indicated that the event increased their interest in trying out nontoxic bottom paint. This is significant in that regulations on copper-based bottom paints may occur due to the elevated dissolved copper levels in some areas.